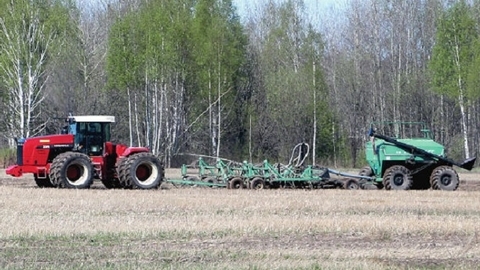 Tyumen farmers will increase plantings of the grain. The total sown area in the Tyumen region will make this year more than a million hectares, which corresponds to the figures of last year; however, farmers plan to increase by 3 thousand hectares sown area of grain and bean — to 683,4 thousand, reported RIA Novosti employee of the press service of the Governor. "The grain seeds and bean, and potatoes in the region above the need. Seeds of maize and oilseed farmers traditionally purchased outside the region. Also this year focuses on the increase in acreage under commercial crops to 52.3 thousand hectares," — said the Agency interlocutor. He added that we have been particularly successful in attracting soft loans for the planting season. If in 2017, was approved 39 applications, including 21 small farm, in the first quarter of 2018 approved 55 applications, including 34 small farms. Governor of Tyumen region Vladimir Yakushev emphasized that sowing should begin in a timely manner, so all the issues should be resolved in a timely manner. Developed work plans, the preliminary structure of sown areas, conducted inspections and mutual verification of readiness of the machine-tractor Park, agricultural meetings are held to improve the technology field work with the involvement of representatives of agricultural science and experience of advanced economies. "It is important that enterprises receive the necessary resources and not disrupted sowing. All you need to carry out in accordance with approved plans," - said the head of the region.